He received degree of lawyer but one day realized that he wants to fulfill his potential in sport. 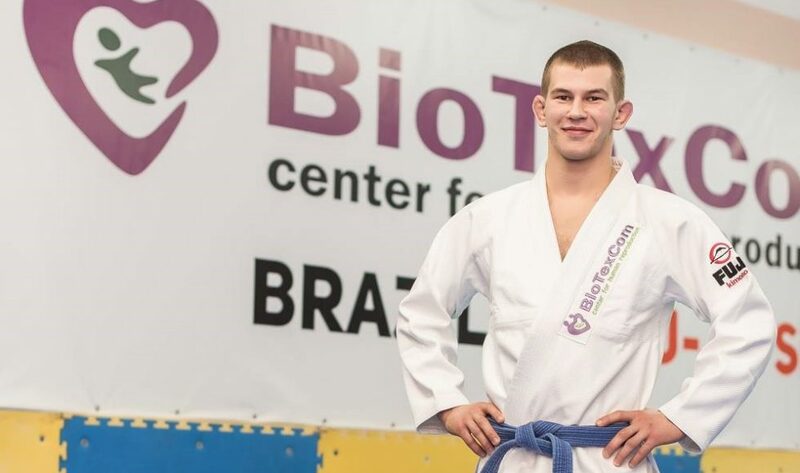 And it was a right decision because Yaroslav gets only prize-winning places at all-Ukrainian and international jiu-jitsu championships. Recently, he came back with the gold medal from the European tournament which took place in France. For five years I have been going in for jiu-jitsu. At first I was engaged in Taekwondo. And one day I started to train with Ievgen Skyrda and I cached the interest of jiu-jitsu. In our city (Kropivnitskiy) Federation of Brazilian Jiu-Jitsu was opened in 2013. Thus, I began to do only this kind of sport. Jiu-jitsu has caught my fancy from the beginning. I understood that I am fascinated only by fight. The majority of action we made on the mat, in other words, fight takes place on the ground. It reduces the risk of serious injuries. Also, I used to go in for gymnastics in the past. But Brazilian jiu-jitsu has become my lifestyle. I am busy now with development of our club and own trainings. And sport also has changed my common lifestyle. For example I can`t eat even a piece of junk food because it can effect negatively on my results during the competition. My family fully supports me, because my father also a sportsman. He helps me in issues that concerns sport. My father brought me up as a real athlete since my childhood. I started to do an exercises on the bar since I was four. So, of course, he likes what I do now. I studied at the university and could be a layer. Being on the third course of the law university I got acquainted with Brazilian Jiu-Jitsu. And I realized the unnecessity of my law degree (smiling). Of course, I got my diploma but it wasn`t necessary for me. I understood that work with documents is not mine. I can`t say that it`s difficult to live in such rhythm. I don’t have problems with my physical condition. I feel great. If we get tired in the middle of the week, the coach gives us time to recover. And then we work using all our potential. But we don’t have much time to rest, thus we try to work in the most productive manner. I wake up around 9:00, have my breakfast and go for morning training. After the training we clean gym hall. FFrom 12:00 to 15:30 we have a free time, and I can have some rest. Training for children begins at 16:00 and ends at 19:30. After that I have a time for own training. As a rule, I finish at 22:00. And only after that I can go home. It is impossible to rest and at the same time develop and improve your results. You should spend all your strength during the training. We will be able to have a rest later. For example, we can rest retiring on a pension. All my life I associate with sport. We want our club to be the best one in the world. Now we are the best ones in Ukraine, but we try our best to move towards Europe. We also explain parents that fight can`t be without injury. And there is nothing to worry about. We teach little boys to be real men. We also train girls. Sometimes they have even more fighting spirit than boys. Everything happens but we haven’t had serious accidents in the younger group (children aged from three to six years). I think people should do what they like. You can`t go to work only for material aim because nothing will come of it. Those guys who work in the “Borets” club put all their heart and soul in the trainings. Thus, the first of all it is necessary to have a desire to work at the highest quality level. I have already participated in many competitions. I even can`t remind all the national ones. We competed during the European Championship in Portugal last year. There I managed to win the second place.There was also European Championship in April and it was held in Rome. There I won a gold medal. In late April, right after the Rome we flew to the World Cup in Abu Dhabi (UAE). There I won three fights, but lost the fourth on points. We decided that we need to have more practice. We will try to get the first place during the next tournament. Sport is very important in our life. Some people believe that job and education must be on the first place. And, it isn’t so, actually. After 30 it can be some problems with health. You need to exercise in order to avoid such problem. And it can be done along with other areas of activity. Athletes have such thing as “absolute weight category”. At first I compete with the athletes who weight 70 kilograms. If I get the top place, I will compete with athletes who win in other weight category. We always try to get first places. It once again confirms that weight doesn’t make a difference. About 20 athletes performed in my weight category during the international tournament in France. I beat the athlete from France in the fourth final fight. All opponents had an advanced level of training. Sometimes some problems can arise during the competition. Generally, when the opponent uses the technique which block my actions. And in those moments, you should think how to get out of this situation. It`s important to control everything. And I coped with it.